An article in the Joongang Daily today points to the obvious importance of operating systems in the rapidly changing "smart phone" market. 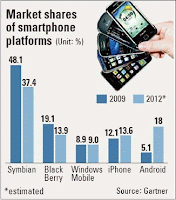 As shown in the accompanying graphic, the iPhone and Android phones are expected to gain market share over the next several years, at the expense of Symbian, Blackberry and Windows Mobile. As the article notes, consumers are more and more likely to ask themselves, "Do I want an Android or a Windows Mobile?" rather than "Do I want a Samsung or Motorola?" This observation is partly true, but what is really going to drive consumer decisions in the next several years is not the OS per se, but rather the information that is accessible and the power of the applications allowed with that OS and how the OS interacts with the applications. To put it another way, if Google's array of online applications work equally well on an Android, iPhone or Symbian phone, then those three operating systems are going to share the market roughly equally. It is the underlying content and information, rather than the OS itself, that will determine the power of these new handheld devices. They are more than simply "smart phones," and they are also more than just a hand-held personal computer. They are information machines that draw heavily upon mobile access to broadband internet, global positioning data, and live visual information (as in augmented reality applications like the iPhone's INeedCoffee app here in Korea). It will indeed be interesting to see which OS prevails, but it would seem that in terms of applications that "organize the world's information" Google is way out in front. That is why I would not be surprised if Android phones take up even more of the global market by 2012 than the graphic here (click to see full size graphic from Gartner) suggests, on the shoulders of Google's information services.